* Decreases skin wrinkles & brown spots. * Increases endurance & lessens fatigue. * Reduces visceral (belly) fat. 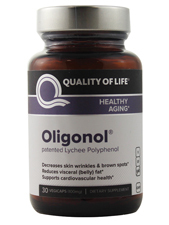 Derived from lychee fruit, Oligonol is the world's first low-molecular-weight polyphenol and winner ot the prestigious Nutracon Best New Ingredient NutrAward. Warnings: Keep out of the reach of children. Consult your healthcare professional before use if you are pregnant or lactating, have or had a medical condition, or are taking prescription drugs, especially blood thinners. Suggested Use: 1 Vegicap daily with a meal for circulation support and fatigue reduction. Double the dosage for visceral fat reduction.